This birthday card for my father in-law features Di's Digistamps Let's Eat Ted's Cake. Di's seems to be my go-to brand for my father in-law's cards; like this Foot (soccer) Father's Day card or last year's Gentleman Ted birthday card. 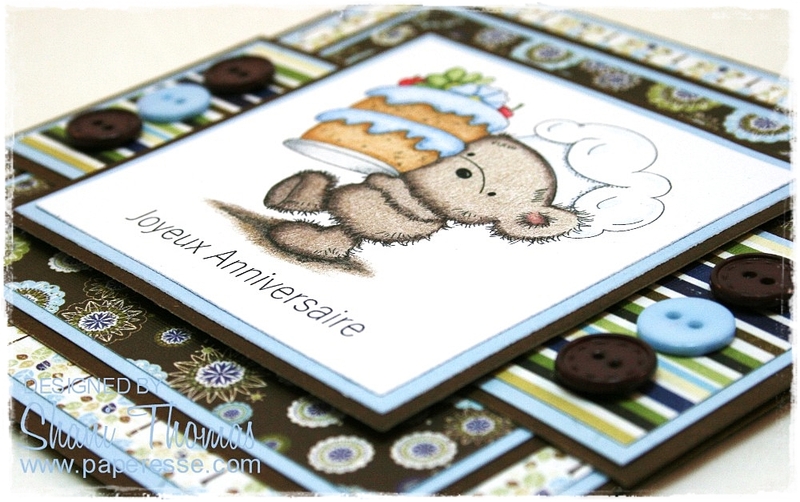 I've raided my stash for this card; paper is a no name brand I picked up quite some time back from the grocery store sale bin and embellishments are simple buttons I've had a while. The sentiment was created with Yu Gothic Light font. I'm linking up with: Di's Digi Challenge 27/07/18 – Use stash items, Back to Basics #9 – Use a digital image, Crafty Creations #372 – ATG, Creative Moments #150 – ATG option Cats, and The Male Room #91 – Male themed Birthday project. Love this image, great card for your father in law, the matching papers and buttons finish the card off. Don't ya love it when you find the perfect items in your "have had for ever" stash? It's like you have been vindicated for hoarding something because you KNEW the day would come when you needed it! Yea! I LOve how those papers go together BTW, and you picked up that blue and green in your frosting quite nicely! That best part for me is ALways your coloring - you have such a delicate touch with your pencils... makes such light, gentle layers of color! Your FIL will be delighted! This is such a good card. I never have enough male cards. Thanks for joining us ang good luck!! Adorable digi stamp and I love the card. Thanks for joining us at Back to Basic and Beyond! Super cute! Splendid papers and ya gotta love blue & brown together. Fantastic colouring too (as always). Love the papers and the colours, such a cute digi too. Thanks so much for sharing with us at the Male Room 5th birthday. 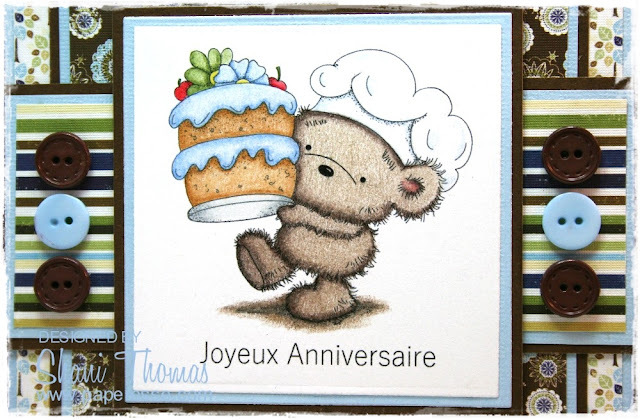 Such a stylish and so beautiful card :-)) I like the pretty stamp and your colouring is so god. Thank you so much for sharing our 5th birthday challenge at The Male Room. Blue and brown are superb together. The yummy image is delightful. Beautifully crafted card. Ahhhh! Encore des beaux papiers! Tu as un très bon goût pour combiner les papiers Shani et l'image est très mignonne... Je vais te piquer ton sketch, j'aime beaucoup le design... Je suis que ton beau-père était très content!! !